Although deglaciation had been taking place for at least 4,000 years, a rapid deterioration (cooling) in climate occurred at about 10 to 11Ka, roughly marking the boundary between Holocene and Pleistocene Epochs. This event is known as the Younger Dryas Cooling. The North Atlantic polar front readvanced far southward to approximately 45N (only 5 or 10 north of the glacial maximum position), and cooling was especially strong in the circum-subpolar basin (Broecker et al., 1988). 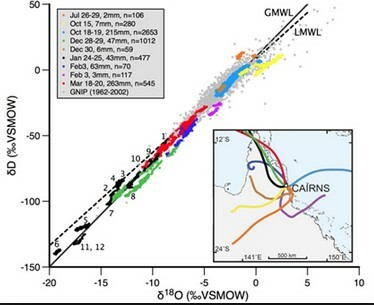 Figure 5.17 shows a record of carbon and oxygen isotopes of surface waters that provide evidence for North Atlantic cooling (Boyle & Keigwin, 1987). In particular, increases in ocean productivity (higher 13C) coincide with cooler temperatures in Greenland (higher 18O). 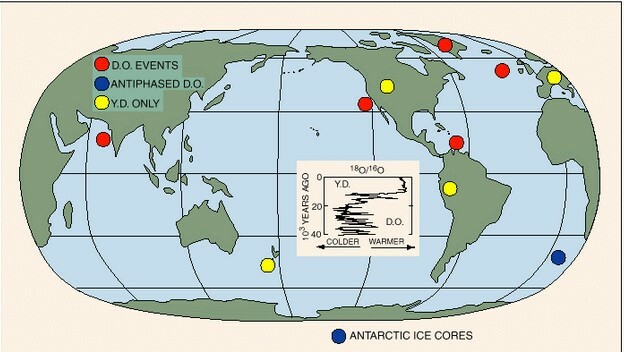 The Younger Dryas cooling event may have been caused by meltwater-induced changes in the atmosphere-ocean circulation. During the early stages of deglaciation, much of the meltwater from the Laurentide (North American) Ice Sheet emptied primarily into the Gulf of Mexico. By about 11Ka, the ice margin had retreated sufficiently to open up drainage into the St. Lawrence Seaway, near Newfoundland (Broecker et al., 1988). The subsequent outflow of meltwater could have created a low-salinity lens in the subpolar North Atlantic. Such low-salinity water would not be dense enough to sink through the pycnocline (salinity density gradient at about 100m depth). The lack of overturn might reduce or temporarily shut down production of NADW. 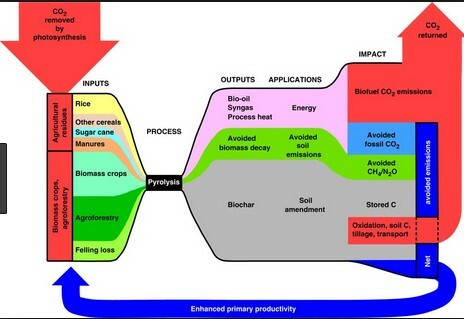 Geochemical evidence (Boyle & Keigwin, 1987) indeed supports this scenario. Subsequent drawdown of CO2 from the atmosphere would then reduce greenhouse forcing of the climate. Unfortunately, evidence of CO2 reduction during the Younger Dryas (Stauffer et al., 1985) remains inconclusive. Since the production of NADW results in an export of cold deep water from the North Atlantic basin and an import of warm South Atlantic surface waters (Figure 2.6), a reduction in NADW production rates might be expected to result in decreased flow of South Equatorial Current across the equator (today known as the Gulf Stream), cooling waters north of the equator and warming them to the south. Such a reduction in northward heat transport would enhance the cooling of the North Atlantic region. Indeed, Broecker (1987) has proposed that such a mechanism of circulation mode interchanges may be a primary factor in the regulation of millennia scale climate change (section 2.6.4).